As much as I love cooking, I often don't have time to assemble a whole meal. On days, when everyday life with job/s, errands, kids, family and grocery shopping take over I realize that I cannot live on nuts, seeds, raisins and apples (all of which I consume in huge amounts) alone. I hit a stage when I need a proper meal. In those moments I like to just open my fridge door and find something. Ten years ago, it would have been a sandwich with ham or cheese. But now that I got used to eating much healthier, a sandwich usually doesn't do it anymore. These days, I usually have cooked rice and pesto in the fridge. That with some finely chopped cucumbers and sprinkled with some toasted nuts or seeds on top has been my favorite lunch recently. But now I have a new kid on the block. Inspired by lots of salads with tahini dressing that I have seen during a food styling job, I started experimenting with it at home. 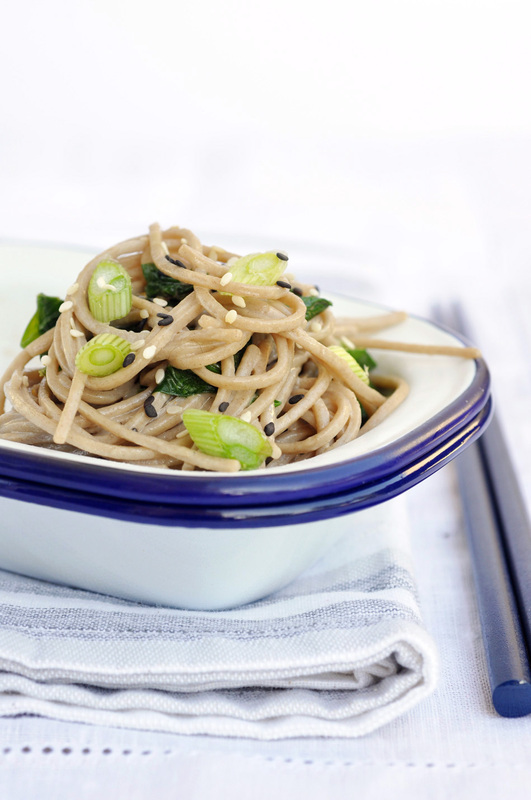 Now here is the result: gluten-free soba noodles in tahini dressing with wilted spinach. I am in love with this dish and cook huge batches that I eat all by myself over several days, as this dish can be eaten warm or cold. It tick all the boxes for me: it;s gluten free, it has nuts or seeds in it, it has green leafy veggies in it, it's vegan, it's filling, it's delicious and it can be made in advance. The perfect lunchbox salad for busy people. Bon appetit! In the meantime, heat olive oil in a pan over medium heat. Add garlic and cook until fragrant. Add spinach and cook until just wilted. Take off the heat and set aside. For the dressing, whisk together tahini, sesame oil, soy sauce and vinegar. Stir in hot water until the dressing gets a thick but runny consistency. Set aside. Drain soba noodles when cooked. Stir in 1 1/2 tablespoons of dressing for each one cup of noodles. Fold in wilted spinach. Sprinkle with sesame seeds and chopped scallions. Can be eaten warm, at room temperature or cold.